Foundation: I have given so many different foundation brushes a try, but I just can’t keep myself from coming back to the beautyblender over and over again. There are many sponges out there that try to be like the beautyblender but, trust me, they’re just not the same. (There is one knock-off I like that I talk about in this post here) My beautyblender gives me that flawless finish with my foundation and concealer that I’m looking for; and blending my makeup goes so much faster with the beautyblender. It’s THE makeup sponge that I can’t live without. Contour: Two summers ago I was struggling with a lower back injury and couldn’t do much physical activity, so in that downtime I became addicted to watching YouTube makeup tutorials. That’s how I discovered one of my favorite beauty bloggers, Angela Lanter. She raved about this Urban Decay contour brush because of the angled brush on one end and a blunt blender brush on the other. I’m all about quick and easy when it comes to makeup, and since I was new to contouring at the time, this was the perfect brush to ease me into it. 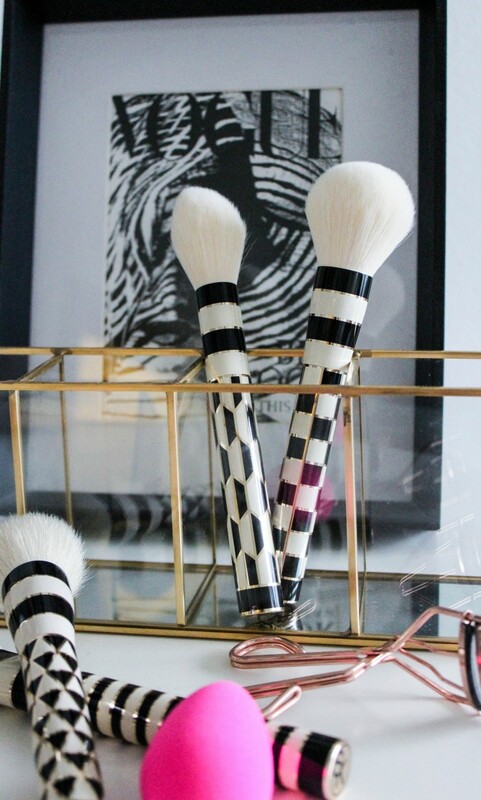 Cheeks: I’ve been around the block a few times when it comes to blush brushes. One day I want to make the investment into the Nars blush brush. But until then, I’ll continue to use my trusted Ecotools blush brush. I love that these brushes are high quality but at an affordable price. The bristles don’t fall out onto my face when I use this brush and it applies blush so smoothly. These tools are also made to last! I’ve had a few Ecotools brushes for over 4 years now and haven’t noticed one bit of reduction in quality over the time. I recently added an Ecotools fan brush to apply highlight and boy has it been a game changer! Blending: From contour, blush, highlight, etc., lots of lines can build on your face. To smooth the transition between the colors and achieve a more blended look, I like to dip this Ecotools blending brush in my Charlotte Tilbury setting powder and blend in circular motions all around my face. I also make sure to blend right on my jawline down onto my neck so there are no harsh lines when I step out into the daylight. 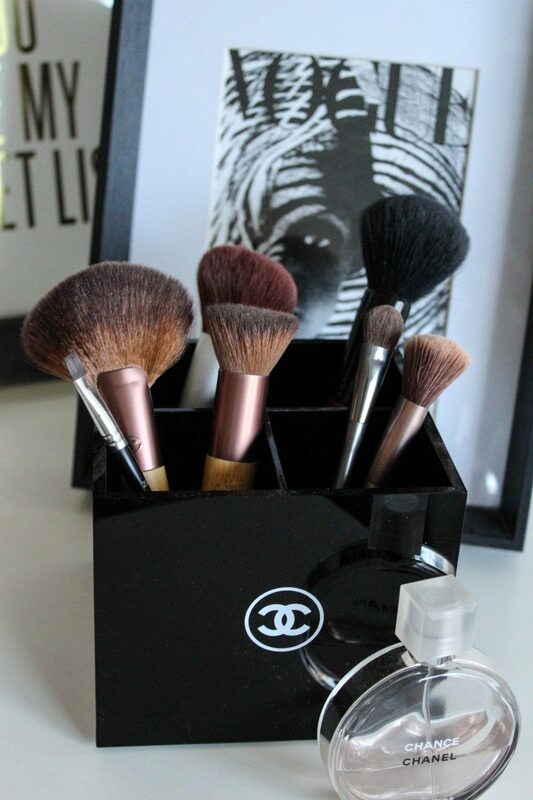 This blending brush is so important to get that natural edge to your look! Shadow: All the time, I get asked, “How do you do makeup? I just can’t figure it out.” And trust me, it all comes down to brushes. I see eyes widen when they see my brush collection but they really are the key to getting the desired looks you want! When it comes to eyeshadow, I feel that the key brushes are a large shadow brush to apply base shadows from your lids to your brow bones and a fluffy crease brush. This large shadow brush from Ulta has been a recent addition, and it is a great brush to have in your arsenal as well as very affordable. Now I recommend having two different kinds of fluffy crease brushes. One should be fluffy but a bit more compact to really pack color and depth into your creases. The other should be much looser. The looser crease brush is perfect for applying and blending darker shadows to your outer corner. This allows for it not to be too heavy of an application but still pack in the drama of the shade. Brows: One golden nugget of my mom’s advice has been to basically leave my eyebrows alone! She knew of my perfectionistic ways (because she is also a perfectionist ;)) and warned me early on about over-plucking. Because if you overpluck for too long, there won’t be much eyebrow left down the road. So I like to say that I let mine “go wild” meaning I rarely pluck them and get them sugared maybe every 3 months. In the meantime, though, when they are getting rather unruly I clean them up with this little eyebrow razor (also good for taking off unwanted upper lip hairs). I just lightly follow the shape of my brow and clean up around the edges. For filling in and shaping my brows, I wouldn’t use anything other than this Anastasia brow brush. The brush end is so precise which allows me to avoid applying too much product. I also love the spoolie on the other end because it really helps blend and give my eyebrows a natural look. Lashes: Keeping my lash game at its very best is something that’s very important to me when it comes to my makeup. I stand by Neulash as one of the best lash growth serums to use to see incredible results. It has been a little over a year since I started using it and it’s now an essential in my makeup routine. While it’s not technically a makeup ‘brush,’ it is one of my favorite tools for getting my best makeup looks. Even though my lashes are long, they just stick straight out and don’t have a lot of natural curl to them. Before I apply my mascara, I love to curl my lashes with this Tweezerman eyelash curler. It does a great job of curling my lashes so that the curl stays all day. My lashes don’t droop once my mascara is on.